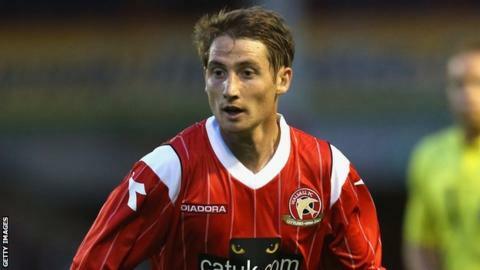 National League strugglers Kidderminster Harriers have made a double signing after agreeing deals for former Walsall winger James McQuilkin and teenage striker George Obosu. McQuilkin, 26, spent most of last season with Torquay and joins Harriers on non-contract terms, having had a loan spell at Aggborough in early 2012. Obosu, 18, has signed a deal until the end of January. Both players are in line for their debuts in Tuesday's game at Chester FC. "George has been with us for well over a month now and is just getting better and better," Harriers head coach Dave Hockaday said. "He is one for the future but, with George, that future may be just around the corner - he's a talented player. "James has experience of this level, but is also very hungry - we're really happy to be working with him." After going 18 games without a win at the start of the season and being dumped out of the FA Cup by Stourbridge, Harriers beat Woking on Saturday to lift themselves off the bottom of the table.